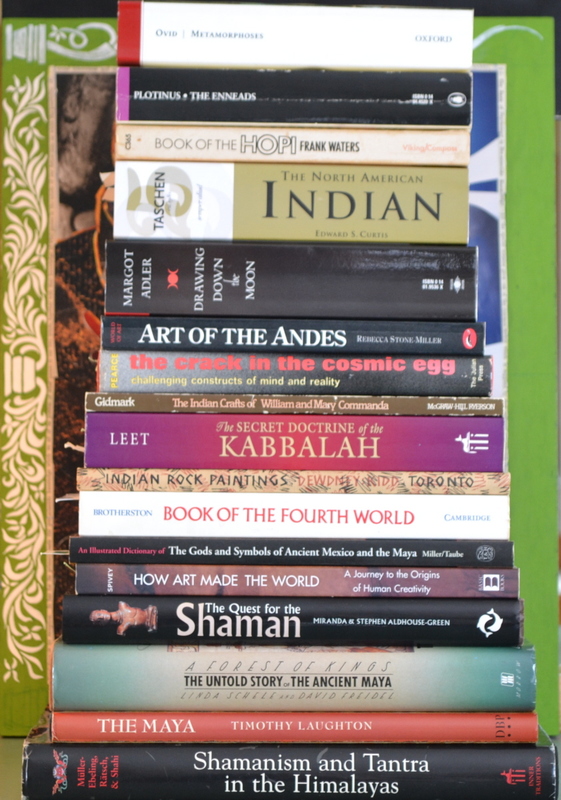 An assembly of some of my favourite reading material… primitive cultures and their practices which have not only survived into the modern world, but are of great contemporary interest. What is to be found in reading such material often has an illuminating effect in that it puts in perspective spiritual thinking. I believe it to be an arrow aimed at the heart of dogma. This entry was posted in Photography, Writing and tagged art, books, literature, primitive. Bookmark the permalink. Have you heard of The World Until Yesterday? http://www.amazon.com/The-World-Until-Yesterday-Traditional/dp/0670024813/ref=sr_1_1?ie=UTF8&qid=1363443316&sr=8-1&keywords=jared+diamond+the+world+until+yesterday+what+can+we+learn+from+traditional+societies You might like it, judging from this, and I really love Jared Diamond’s books. Excellent suggestion. I’ve read Collapse and Guns, Germs and Steel is on my bucket list. Now I have another to add, so thanks. An imposing stack of knowledge you’ve laid out for yourself. Reminds me of Joseph Campbell, handing out his reading list to students at Sarah Lawrence, and one of the students telling him no One could read all on the list in a semester. He told her she had a lifetime, not a semester. A difference of horizons. There’s reading, then there’s speed reading and finally, there’s my method… the dartboard method. In this way, I read bits from various books over the years until I finally have taken all of it in. There are a few non-fiction books which I’ve read (and re-read) cover to cover over a stretch of time. For instance, The Decline and Fall of the Roman Empire which I found to be important in understanding contemporary events. I have a tattered edition which I’ll be photographing in a future post and plan to add a few tidbits which might tempt people to also pick it up. It’s a daunting book, though… almost two and a half centuries have passed since the book was published in its entirety (1776) which makes for a difficult lexicon. When I left the world of bookstores and Wal-Marts I had to downsize from hundreds to 25 books…and I read all of them all the time. That’s why all my sort of book reviews cover books that are easy to pick up at any point, or are compartmentalized in essays, articles, or novellas which I can read on a bus or boat trip. It has definitely changed the way I think, this mish-mosh of words, thoughts, opinions, and style. Shamanism and Tantra is a remarkable book. The plates are fantastic and can be studied with a magnifying glass (as I have done). The information which accompanies those images is not easily found elsewhere. On ‘Quest’, you can tell how often I’ve gone back to it by looking at the pristine quality of the cover. The drawings which are included were what prompted me to buy it in the first place. I did manage to get through it, but it was either badly written or badly edited. Aggravating lack of necessary information for such a heavily footnoted amd referenced book. What a marvelous visual. We can list books, but the connection between one book to another is tricky to see. In the right context, this is splendid of saying a lot without saying too much. Nice one. I’ve got a horizontal spread of books on the Muscogee (Creek), my ancestors and the tribe to which I belong..